Mormon Wookiee: #38: Jabba the Hutt and the "Seven Deadly Sins". I was thinking about vices the other day (not Miami vices, just regular ones). Since early times, Christian churches have warned about the "Seven Deadly Sins" or "Capital Vices" of wrath, greed, sloth, pride, lust, envy, and gluttony. Let's call them "the 7DS" for short (quite similar to the name of a Nintendo handheld gaming device). As I was thinking about the 7DS, I realized that there is someone who perfectly embodies them all: Mr. Jabba Desilijic Tiure, more commonly known as "Jabba the Hutt". Wrath: Gee, this guy can get angry. All you have to do is drop some of his illegal cargo without paying him back, and he'll hunt you to the end of the galaxy. And then turn you into a wall trophy. Han Solo: Smuggler. Hero. Wall Trophy. Greed: How much money does a 1,200 pound slug really need? Apparently more than he's currently got. 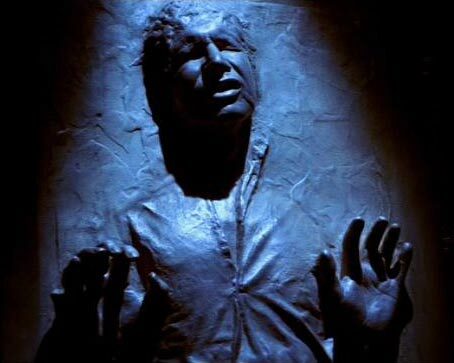 Jabba is always getting involved in illegal schemes to make a quick buck. Sloth: Um....he's a giant slug. 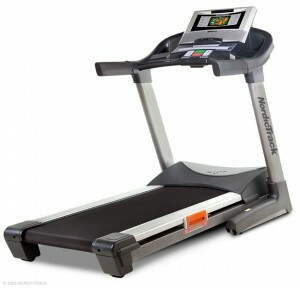 I don't see him getting on a NordicTrack anytime soon, do you? Pride: Jabba considers himself to be invincible. 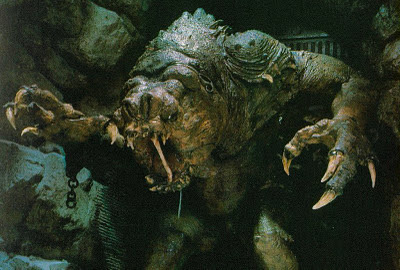 He mocks anyone who dares to challenge him, and if he doesn't like you, he will just feed you to his pet Rancor. Lust: Jabba loves women. 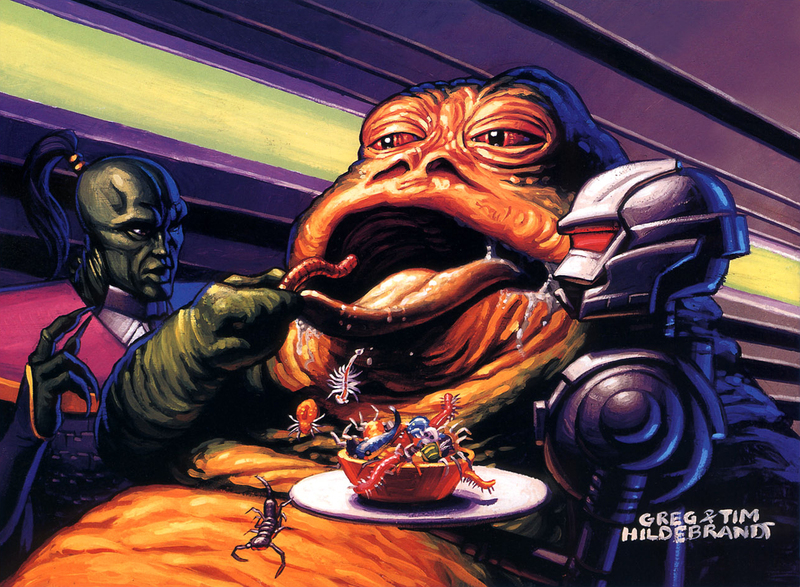 It doesn't matter if they are human, Twi'lek, or Hutt--he loves them all. And he loves to enslave them. Fortunately, for us, Princess Leia showed Jabba who was boss by strangling him with the very chain he had enslaved her with. Power to the people! Envy: If Jabba sees something that he doesn't have, he is very jealous. 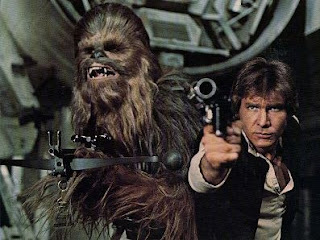 Case in point: It drove him nuts that it took him three whole movies to capture Han Solo and Chewbacca. Catch us if you can, slug man! Gluttony: Of all the 7DS, I bet that gluttony may be Jabba's greatest weakness. I can only imagine what his grocery bills are like. Jabba makes a cameo appearance in the bug-eating scene of "The Lion King". Hakuna Matata! So, what does this have to do with you and me? 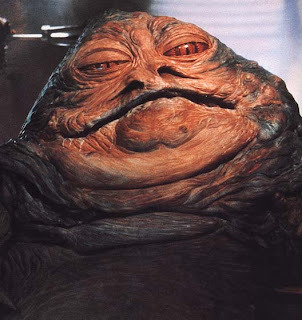 Basically, this is just a reminder to not become like Jabba the Hutt. I always feel badly when I give into my own vices, like being unnecessarily lazy, losing my temper, or eating a whole bag of peanut butter M&Ms right after fasting (you'd think that after 20+ years of fasting each month I would learn that it hurts to have a stomachache when I eat too much junk afterwards). Battling sin and temptation is a daily battle, and we can never give up trying. Fortunately for us, we all have the opportunity to repent and keep working on improving every day. It won't happen overnight, but it sure beats the alternative of becoming a giant sentient slug. Rest in peace, Jabba. Rest in peace. Oh man. The Nintendo 7DS would be awesome. Great post, by the way. It's amazing that Jabba batted 1.000 in the deadly sins homerun derby. Lol, let's not scare these people into thinking that Mormons not only baptize dead people, but fake ones too.